While creating a logo or adding text on a screenshot to explain something, we need handwriting fonts to give a personal touch. Here are 16 handwriting fonts which are available to download for free and use on your computer or you can also use these fonts on your website as well. These 16 handwriting fonts are available on Google Fonts Directory from where you can download them one by one. As these are available for free on Google’s server, you can add extra line in your Website’s HTML to include and use these fonts over there as well. We have already explained best fonts for Newsletters and blog posts but these handwriting fonts are also required for different purposes. Go and grab these raw handwriting fonts which are available for free. 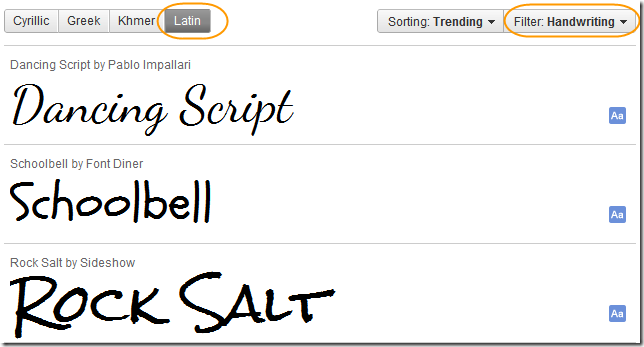 Now you can see the list of handwriting fonts available on Google Web Fonts. Click on any of them and on next page, you can see the download button. From there you can download and save these fonts one by one on your personal computer and install them over there. To use the handwriting or other fonts available on Google Web Fonts, you will have to add extra line of HTML code in your Website’s HTML file or template. 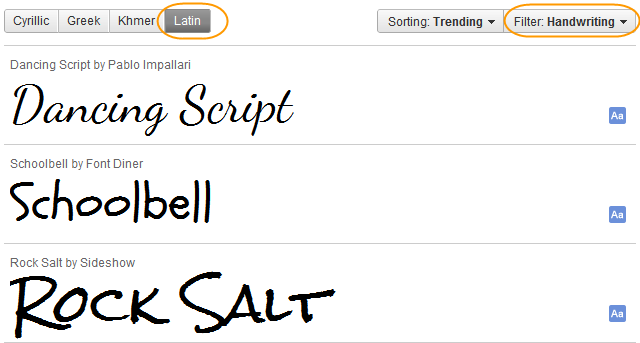 For example, to use the font named “Vibur”, you will have to add below code in the HEAD section of your website’s HTML. Now you can use this font in your own CSS for headers like H1, H2, H3, H4 etc. or for other texts as well. Those texts will appear in the font included and specified by you. You don’t need to download and save the fonts on your own server as they will be taken from Google’s server. To read more about adding effects and style to Google Fonts, read this page. There are multiple places from where you can download 1000s of beautiful fonts but none can beat the reliability of Google.